The 2018 Jeep Compass is beautifully designed from the wheels up. Even the base model is stylish enough to turn heads. However, if you want to make your ride your own, this popular compact SUV has plenty of exterior styling options available. One upgrade is a black roof. Glossy black paint is used to cover the roof panel. It's surrounded by a shiny chrome border to add a touch of sophistication. If chrome is more your style, you'll be happy to know that you can add accents throughout the body of the SUV. You can get polished chrome on the side mirrors or as an exhaust cap in the back. Want to learn more about your exterior styling options? Stop by Gillie Hyde Dodge Chrysler Jeep RAM today. 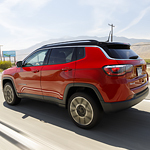 We'll walk you through the optional upgrades and answer any questions you may have about the 2018 Jeep Compass. We'll even set you up for a test drive around Glasgow.